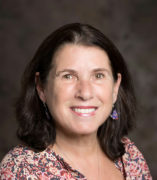 Pamela Bondy has worked in the Family Clinic as a bilingual (Spanish) Speech Language Pathologist for 20 years, providing diagnostic and therapeutic services to both English and Bilingual children. Her expertise in Autism Spectrum Disorder and other language challenges that affect social interaction and ability to develop friendships led her to add Social Skills intervention to her clinic work. Pamela leads social skills groups for adolescents using Games as a tool to learn these important abilities. Additionally, Pamela has many years of experience with Early Intervention and provides center based and home based speech therapy with the UIC Child and Family Early Intervention Program.